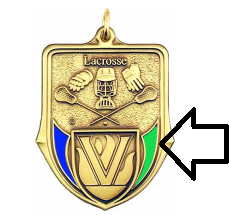 “2” x 1 ½” Medal with loop available in antique finished brass (goldtone), nickel-silver (silvertone) or copper (bronzetone). Engraveable backside. Add up to two inserts and color to the stars and stripes for a custom style medal. Engraving Text Line 3 (18 Character Limit) ? Engraving Text Line 4 (18 Character Limit) ? Engraving Text Line 5 (18 Character Limit) ?